It would be hard to conjure a bigger contrast than that between the Saatchi Gallery’s majestic four levels and FOLD’s modest basement space. Actually its director, Kim Savage, used to work for Saatchi, and there turn out to be echoes. Saatchi has lots on now, of wildly varying quality, but its ‘Salon’ (organised with Omer Tiroche, to 8 Dec) is one below ground space lit up by Alexander Calder’s vibrant gouaches. FOLD’s one and only room currently has a comparably radiant show by Mali Morris (to 25 Nov). Another Saatchi space holds Maurizio Anzeri’s drawings in thread on found photographs*, revealing a further affinity: both Anzeri and Morris derive much of their effect from the ‘ghosting’ through of what is largely buried. 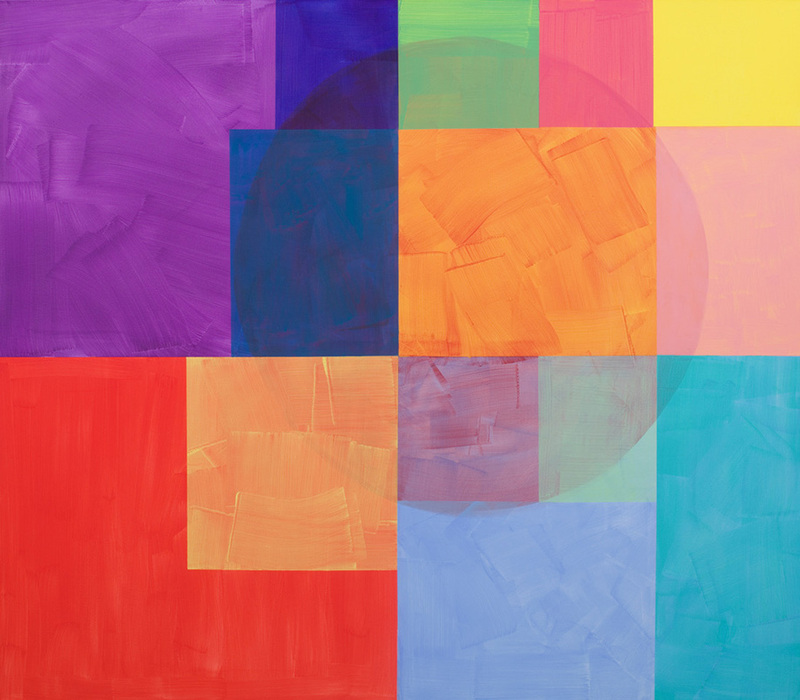 Morris’s big new paintings arise from an elaborate sequence of quartering the canvas into four colours, overlaying an oval of another colour, then adding a top layer of smaller rectangles. That’s done with plenty of masking tape to ensure sharp divisions, but also with very big brushes loaded with gel-thickened paint, so that directional strokes are a prominent feature. That enables Morris, some way from simple geometric abstraction, to effect a sort of double syncopation: a call and response between different colours is itself played off against the visible rhythms of the paint’s application. The oval is left as a ghost, not unlike the ovals of the faces under Anzeri’s embroidery.